Video is a bigger part of the web experience than ever before. With native browser support for HTML5 video elements freeing us from the tyranny of plugins, and the availability of faster internet connections to the workplace, home and mobile networks, it’s now pretty straightforward to publish video in a way that can be consumed in all sorts of ways on all sorts of different web devices. I recently worked on a project where the client had shot some dedicated video shorts to publish on their site. They also had some five-second motion graphics produced to top and tail the videos with context and branding. This pretty common requirement is a great idea on the web, where a user might land at your video having followed a link and be viewing a page without much context. Known as bumpers, these short introduction clips help brand a video and make it look a lot more professional. 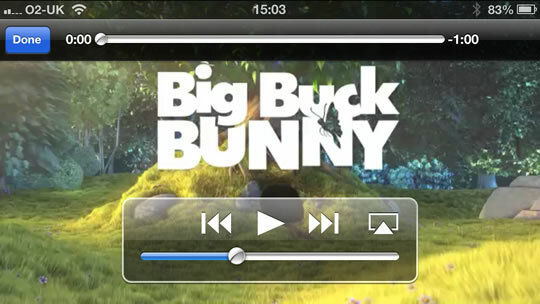 The simplest way to add bumpers to a video would be to edit them on to the start and end of the video file itself. Cooking the bumpers into the video file is easy, but should you ever want to update them it can become a real headache. If the branding needs updating, for example, you’d need to re-edit and re-encode all your videos. Not a fun task. What if the bumpers could be added dynamically? That would enable you to use the same bumper for multiple videos (decreasing download time for users who might watch more than one) and to update the bumpers whenever you wanted. You could change them seasonally, update them for special promotions, run different advertising slots, perform multivariate testing, or even target different bumpers to different users. The trade-off, of course, is that if you dynamically add your bumpers, there’s a chance that a user in a given circumstance might not see the bumper. For example, if the main video feature was uploaded to YouTube, you’d have no way to control the playback. As always, you need to weigh up the pros and cons and make your choice. 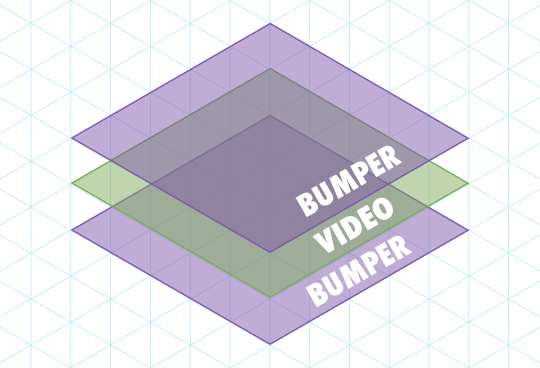 If you wanted to dynamically add bumpers to your HTML5 video, how would you go about it? That was the question I found myself needing to answer for this particular client project. Now that video is just a native object in the DOM, just like an image, why not do the same? Stack the videos up with the opening bumper on top, listen for the video’s onended event, and fade it out to reveal the main feature behind. Good idea, right? Remember that this is the web. It’s never going to be that easy. The problem here is that many non-desktop devices use native, dedicated video players. Think about watching a video on a mobile phone – when you play the video, the phone often goes full-screen in its native player, leaving the web page behind. There’s no opportunity to fade or switch z-index, as the video isn’t being viewed in the page. Your page is left powerless. Powerless! So what can we do? What can we control? Turns out, this old trick of modifying the source can help us out with video, too. In most cases, modifying the src attribute of a <video> element, or perhaps more likely the src attribute of a source element, will swap from one video to another. We could very simply write a script to find all video tags and give them a new src to show our bumper. View the example in a browser with WebM support. You’ll see that the video is swapped out for the opening bumper. Great! Of course, we can’t just publish video in one format. In practical use, you need a <video> element with multiple <source> elements containing your different source formats. This time, our script needs to loop through the sources, not the videos. We’ll use a regular expression replacement to swap out the file name while maintaining the correct file extension. The difference this time is that when changing the src of a <source> we need to call the .load() method on the video to get it to acknowledge the change. See the code in action, this time in a wider range of browsers. As we need to loop through the videos this time to add the event listener, I’ve moved the .load() call into that loop. It’s a bit more efficient to call it only once after modifying all the video’s sources. We need to keep track of whether the src has been changed, so we only play the video if it’s changed. I’ve added the modified variable to track this, and it stops us getting into a situation where the video just loops forever. Add an else to the event listener, for when the orig is false (so the main feature has been playing) to load in the end bumper. We also check that we’re not already playing the end bumper. Because looping. If a search engine or social media bot grabs your page and looks for content, they won’t see your bumper, but they will get the main video – which is absolutely what you want. 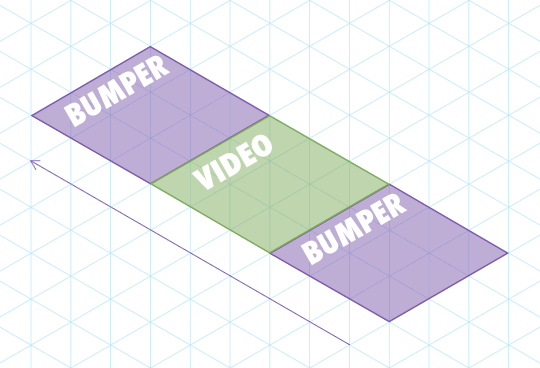 This means that if the bumper is absolutely crucial, you may still need to cook it into the video. However, for many applications, running it dynamically can work quite well. But most of all play around with it, have fun and build something awesome.